Welcome to Giusti's Enterprising Art. Celebrating 35 years in business! 1984-2019. Thank-you! 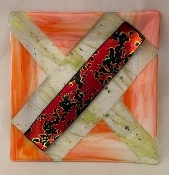 Camp Giusti has opened an on-line store for Tom and Nancy's custom Fused Glass and Raku Ceramics. 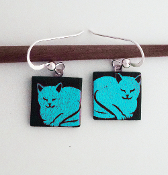 Each piece is unique, one of a kind, hand made by Tom and Nancy. Tom's 10" fused glass Dinner plates.